The San Francisco Botanical Garden in Golden Gate Park is getting set for the annual native plants flowering season. Plus they have some Family Fundays with special activities. We'll start with those, then move on to the every day activities you can do during flowering season. Family Funday on SundayEnjoy a story in the library at 10:30, followed by a guided walk at 11 through the Garden of California Native Plants, where the guide will connect the morning’s story to living plants. Drop by the garden activity station between 11:30-1:30 to create a garden craft project to take home. For: Families with children ages 3-10. The rest of the time - you can enjoy the seasonal flowering of California native plants - the state has almost 6,000 native ones, more than all other states combined, says the Botanical Garden. The 4 acre Garden of California Native Plants blooms April through mid-May, and there are hundreds of  species on view. You'll see blue wild lilac, golden poppies, white and yellow meadowfoam, purple irises, and more. Check out the Garden’s arroyos, ponds and woodlands. Then go to the Garden’s famed Redwood Grove to see the century-old grove, with towering Coast Redwoods, shade-loving ferns, flowering currant, western azalea, huckleberry, and more than 100 species of plants that make their home in the redwood forest. It never really occurred to me that even though Dr. Seuss drew a lot of crazy hats, he might have some real ones for inspiration. A dozen of those hats are going to be on display in the Bay Area, along with paintings he did with hats in them. Read more about Dr. Seuss and his hats, along with the show, in this New York Times article. With a tween girl at home, we've been starting to have "the conversation" or rather "the conversations" (plural). Well, we didn't just start - the talks have been happening for awhile. Friends have taken the Heart to Heart: for Girls Only class at Stanford, for girls and a female adult companion and spoke highly of the class. The class has a book list of possible puberty books you can share with your daughter. I bought a few of them (plus one for a boy). I read a bunch of reviews on Amazon before buying them. I reviewed these books from an adult perspective because I don't think my daughter wants me to share her thoughts on issues like these. I started getting a lot of emails about spam comments on one of my other blogs, and so I went in to clear out the folder. Before doing so I thought I'd share a few of them with you, because they were amusing. Most were from knockoff designer shoe and handbag sites, and some were from sites even less legit. So read on, and know that each paragraph is a different comment. The next time I read a blog, I hope that it doesnt disappoint me as significantly as this 1. I mean, I know it was my option to read, but I truly thought youd have something intriguing to say. All I hear is actually a bunch of whining about something that you could fix in the event you werent too busy looking for attention. i want to take this review to a clean resturant and then see if i can get to second base. Some fun things to do to celebrate Easter with the family in the San Francisco Bay Area. Please add your favorites in the comments section! Cost: $5/child or a donation of 10 filled eggs. $2 discount if you pay by 3/20. What: Puppet Company presents "Grandpa Bunny's Egg-citing Day" - where pupptes explain that the color of eggs comes from the "wonder of the seasons." Craft-making follows. When: Saturday, March 30 at 11:30 a.m. Cost: visit with bunny for free, photos cost. It feels like summer with Sunday Streets starting up again. 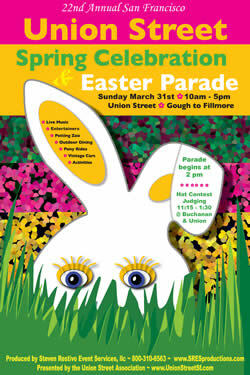 This Sunday, March 10, head over to the Embarcadero for the start of Sunday Streets 2013. It includes activities on Fisherman's Wharf, the Exploratorium on the Move and Pier 39. Activities like a treasure hunt, live entertainment, community film making, a levity chamber, rock climbing walls, Segway obstacle course and more. Find the full list here. 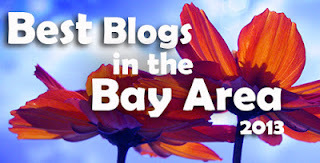 We're thrilled to be included in Chatterblock's list of the Best Bay Area Mom Blogs for 2013. Check out the list and see what good company we're in! If you don't know about Chatterblock, they have great ideas of events and family activities. Here's something different to get your kids into spring and into nature - take them on a guided birding walk. The event includes "binocular boot camp" - which is a bird-watching hike led by Sonoma Birding co-founders Tim Rusert and Darren Peterie. The goal is to find 20-25 species of birds (over 170 of wintering birds might be found). 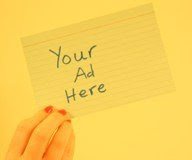 Where: Jack London Park (2400 London Ranch Road, Glen Ellen, CA); meet in the upper parking lot. 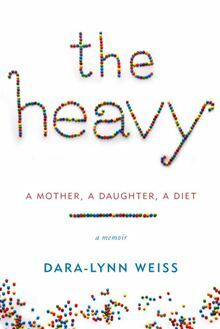 As many people did, I first heard about this book after author Dara-Lynn Weiss published a controversial essay in Vogue about putting her 7 year old daughter on a diet. The comments were terrible and like many mothers I wondered if she did the right thing. I can't even recall if I read the essay or just posts about the essay, but I was intrigued. There was quite a backlash (read this) against the author, and many portrayed her as selfish and shallow. So when the book came out and a friend mentioned she just read it and liked it, I wanted to read it (thanks for the loaner, Gail!). The book is much less sensational than I expected. The author presents valid reasons for putting her daughter Bea on a diet. She was in the obese category and she did not want her daughter growing up with associated health issues. However she also didn't want to give her daughter a complex about food and weight (something I'm guessing most mothers are concerned about), nor stunt her growth. While my 9 year old son Zack isn't the type who loves watching baseball games on TV, and his one season playing elementary school baseball was a fail, he does love to go to live stadium games. Each year he goes on a baseball trip with his dad, uncle and grandfather, and they visit two or three stadiums to take in some games. I recently heard about the Ballpark Mystery series and gave a few to Zack to read. He sat back and tore into them, not stopping until he was done. He wrote his own reviews (below) for Frisco Kids' readers. Another book in the series, based in San Francisco (The San Francisco Splash), is coming out May 28th. We'll get Zack's review along with a guest post from the author, and contest to win a signed copy then. 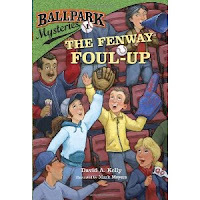 When Mike and his cousin Kate go to the Red Sox stadium, the Red Sox player Big D loses his lucky bat, the Green Monster. Without that bat, he can barely hit the ball. Will Mike and Kate be able to solve the mystery of Big D's bat? 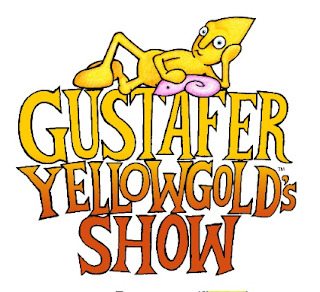 Coming up - a small, yellow, cone-headed fellow from the sun will be doing some performances during his Rock Melon Tour. He'll be in the Bay Area over several days, performing shows and workshops. 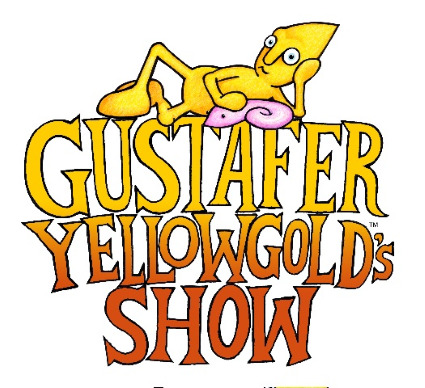 Gustafer Yellowgold’s Rock Melon Tour is reportedly unlike anything in family entertainment. Morgan Taylor’s story-songs about Gustafer and his pals is performed against a backdrop of large-screen animations done up with karaoke-style subtitles, and creates a world as deep and original as it is beautiful. It’s equal parts pop rock concert and minimally animated movie, but mellow. You can see the past DVDs here. When: Saturday, March 9 at 11 a.m. When: Saturday, March 9 at 4 p.m. When: Thursday, March 7 at 10:30 a.m. When: Thursday, March 7 at 4 p.m. When: Sunday, March 10 at 10 a.m. When: Monday, March 11 at 11 a.m. When: Tuesday, March 12 at 10 a.m. When: Tuesday, March 12 at 3 p.m.
Tickets: cartooning/illustration workshop at 3:00 is $20, songwriting workshop at 4:00 is $20, putting it all together at 5:00 is $20.